Many ocular diseases and disorders are associated with pain. Blepharospasm is an obvious manifestation of ocular discomfort. However, behavioral manifestations associated with an internal throbbing ocular pain are often unrecognized. For example, animals with chronic glaucoma or uveitis tend to have symptoms that resemble those associated with simply aging. An afflicted animal may be lethargic, sleep excessively, and become inappetent. Many of these symptoms are not appreciated by working owners who routinely leave their pets alone for many hours each day. Veterinarians may mistakenly judge a pet’s level of discomfort based upon this misinformation provided by an owner. This article will describe the pathophysiology of ocular pain and some of its subtlety. Sensations of pain originating within the cornea, conjunctiva, and uveal tract are transmitted to the brain via the ophthalmologic division of the trigeminal nerve (fifth cranial nerve). The richly innervated cornea is highly sensitive and generates intense nerve impulses in the body of all animals. The iris, ocular muscles, and optic nerve sheaths are also associated with pronounced sensations of pain. Pain associated with corneal and/or conjunctival stimulation is sharp, localized, and is often described by humans as the sensation of a foreign body. Pain associated with stimulation from the iris and/or ciliary body is described as deeply-seated, throbbing, and often radiating throughout the head and other regions innervated by the trigeminal nerve. Minimal sensations of pain have also been described as originating at the sclera. However, the sensation of pain has not been associated with the retina, lens, or optic nerve. 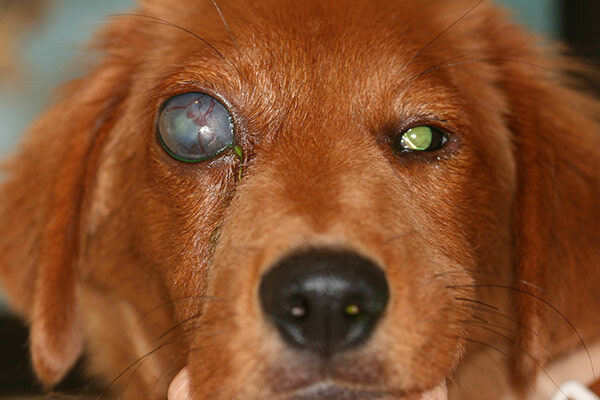 Animals presenting with blepharospasm should first be evaluated by Schirmer tear testing (STT), fluorescein staining, and tonometry. Low STT values may indicate dry eye. Schirmer tear test values that exceed normal levels (> 25 mm/min) may be a sign of pain originating at the ocular surface. Fluorescein staining can reveal both corneal and conjunctival ulcerations, as well as delineate ectopic cilium. Tonometry can reveal glaucoma (increased intraocular pressure) or uveitis (decreased intraocular pressure when compared with an unaffected contralateral eye). The conjunctival and corneal surfaces of animals presenting with blepharospasm should also be thoroughly examined (at 5-fold or greater magnification) for ulcerations, ectopic cilium, and/or the presence of foreign bodies. The area beneath the third eyelid is best examined following elevation of the nictitans with Adson-Brown forceps. Unfortunately, humans cannot fully evaluate the cognitive state of an animal to help appreciate its level of ocular pain. However, the relief of that pain is clearly rewarding for pets, owners, and veterinarians. If you have any questions regarding the signs of ocular pain, please feel free to consult with your veterinary ophthalmologist.